A look at who makes up Prime Minister Justin Trudeau's cabinet. Prime Minister Justin Trudeau substantively shook up his cabinet Wednesday morning. 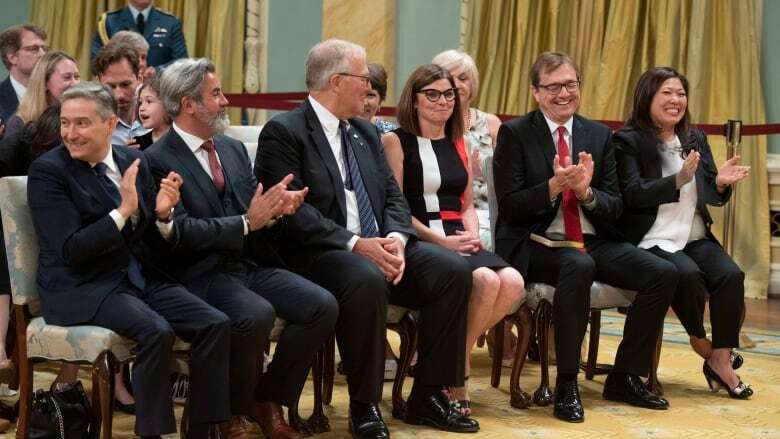 The Prime Minister's Office added five new seats at the cabinet table and played a round of musical chairs with other departments. Here is a complete list of who is doing what ahead of the 2019 election. New additions to the cabinet are in bold, ministers who have changed portfolios are indicated with an asterisk* and ministers who are staying in their role but whose titles or responsibilities have changed are italicized. *Dominic LeBlanc - Minister of Intergovernmental and Northern Affairs and Internal Trade. LeBlanc will also become President of the Queen's Privy Council for Canada. *James Carr - Minister of International Trade Diversification. *Mélanie Joly- Minister of Tourism, Official Languages and La Francophonie. *Amarjeet Sohi - Minister of Natural Resources. *Carla Qualtrough - Minister of Public Services and Procurement and Accessibility (adds Accessibility). *François-Philippe Champagne - Minister of Infrastructure and Communities. Pablo Rodriguez - Minister of Canadian Heritage and Multiculturalism. Bill Blair - ​Minister of Border Security and Organized Crime Reduction. Mary Ng - Minister of Small Business and Export Promotion. Filomena Tassi - Minister of Seniors. Jonathan Wilkinson - Minister of Fisheries, Oceans and the Canadian Coast Guard. Carolyn Bennett - Minister of Crown-Indigenous Relations. Scott Brison - President of the Treasury Board and Minister of Digital Government. Marie-Claude Bibeau - Minister of International Development. Kirsty Duncan - Minister of Science and Sport. Bardish Chagger - Leader of the Government in the House of Commons. Navdeep Bains - Minister of Innovation, Science and Economic Development. Jean-Yves Duclos - Minister of Families, Children and Social Development. Chrystia Freeland - Minister of Foreign Affairs. Marc Garneau - Minister of Transport. Ralph Goodale - Minister of Public Safety and Emergency Preparedness. Karina Gould - Minister of Democratic Institutions. Patty Hajdu - Minister of Employment, Workforce Development and Labour. Ahmed Hussen- Minister of Immigration, Refugees and Citizenship. Diane Lebouthillier - Minister of National Revenue. Lawrence MacAulay - Minister of Agriculture and Agri-Food. Catherine McKenna - Minister of Environment and Climate Change. Maryam Monsef - Minister of Status of Women. Bill Morneau - Minister of Finance. Seamus O'Regan- Minister of Veterans Affairs. Ginette Petitpas-Taylor - Minister of Health. Jane Philpott - Minister of Indigenous Services. Harjit Sajjan - Minister of National Defence. Jody Wilson-Raybould - Minister of Justice and Attorney General of Canada. Quebec MP Pablo Rodriguez, Ontario MPs Bill Blair, Mary Ng and Filomena Tassi and B.C. MP Jonathan Wilkinson have been elevated to the Liberal cabinet by Prime Minister Justin Trudeau. As Trudeau shuffles his cabinet, which Liberals could use the profile boost at the ballot box?